International Journal of Research in Health Sciences,2013,1,3,110-115. 1,2Associate Professors, Department of ENT, Navodaya Medical College, Raichur, Karnataka, INDIA. 3,4Senior Residents, Department of ENT, Navodaya Medical College, Raichur, Karnataka, INDIA. 5Assistant Professor, Department of Ophthalmology, Navodaya Medical College, Raichur, Karnataka, INDIA. 7-Assistant Professor, Department of Pharmacology, Sridevi Institute of Medical Sciences, Tumkur, Karnataka, INDIA. 8-Associate Professor, Department of Biochemistry, FMMC, Mangalore, Karnataka, INDIA. Background: Rhinosinusitis is a common problem that leads to a significant amount of health care expenditure due to direct costs of doctor visits and antibiotics as well as indirect costs related to reduced productivity and a decreased quality of life. Objective: To study the pattern of mucosal involvement in chronic rhinosinusitis using computed tomography of 100 patients. Design: A prospective study of mucosal involvement of paranasal sinus region was done on 100 computed tomography scans of patients with chronic rhinosinusitis. Results: The most common site of involvement was osteomeatal complex followed by maxillary antrum. 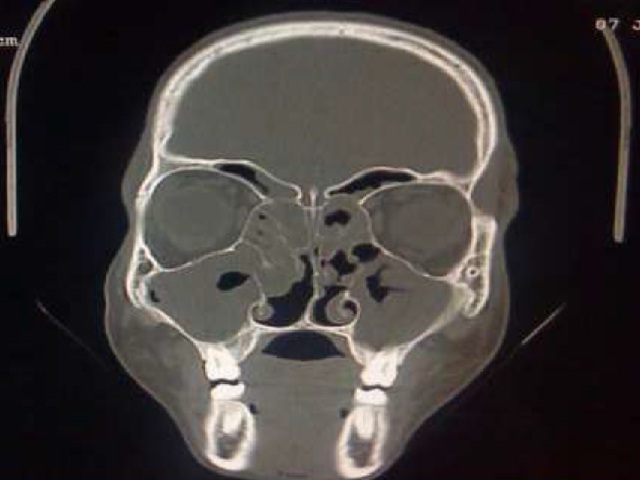 This was followed by anterior ethmoids, posterior ethmoida, frontal sinus and sphenoid sinus, in that order. Conclusion: Osteomeatal complex is the most common site to get involved in chronic rhinosinusitis. The blockade in the osteomeatal complex subsequently leads to impaired drainage and inflammation in maxillary, ethmoid and frontal sinuses. Removal of disease in Osteomeatal complex region is the basic principle of Functional Endoscopic Sinus Surgery which is best appreciated on CT scan.